All prices listed are for general reader interest only, and are shown in this order: $ (USD)/£ (GBP). All prices listed are Hammer Price (the winning bid amount) unless noted as Premium, indicating that the figure quoted includes the Buyer’s Premium of an additional percentage charged by the auction house, as well as taxes. 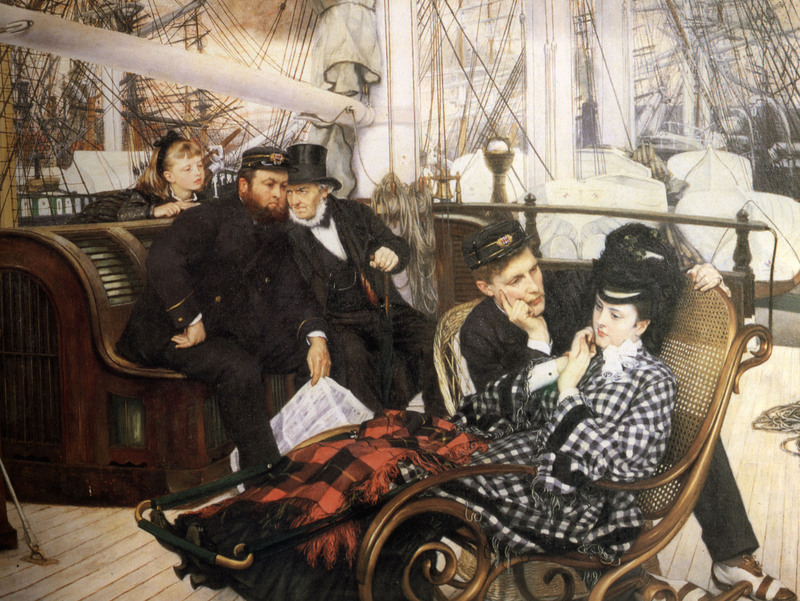 James Tissot’s A Visit to the Yacht (c. 1873, oil on canvas) will be sold at Sotheby’s, London on December 4, 2013. 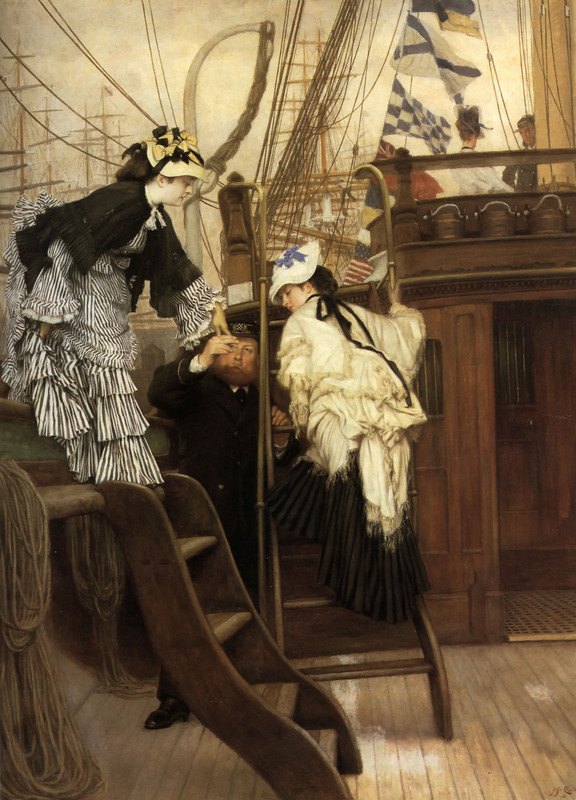 Painted within Tissot’s first two years in London, after he fled the bloody aftermath of the Franco-Prussian War, the painting is expected to bring between £2 and 3 million GBP. 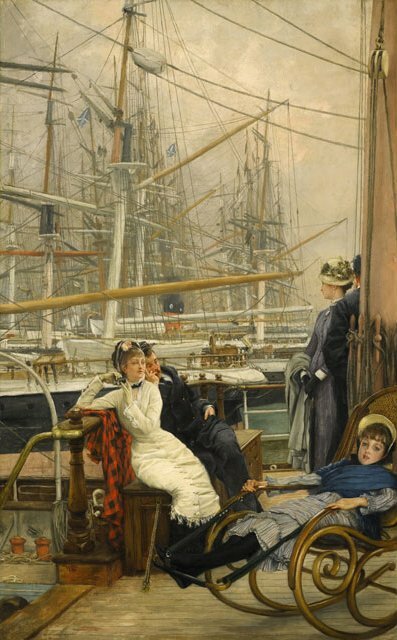 A Visit to the Yacht is one of three Victorian masterpieces from the private collection of the industrialist William Hesketh Lever, 1st Viscount Leverhulme and his son William Hulme Lever in Sotheby’s Old Master & British Paintings Evening Sale. The sale includes A Christmas Carol (1867, oil on panel, 18 by 15 in./46 by 39 cm) by Dante Gabriel Rossetti, estimated at £4-6 million, and Tuscan Girl Plaiting Straw (1869, oil on canvas, 21 by 16 in./52 by 42 cm) by William Holman Hunt, said to be worth £3 and 5 million. William Hesketh Lever (1851 – 1925) left school at sixteen to began his career as an assistant in his father’s grocery warehouse in Bolton, Lancashire, England. In 1874, Lever married Elizabeth Ellen Hulme, daughter of a draper and neighbour from Wood Street. He and his younger brother, James, an invalid, founded the soap company Lever Brothers (now part of Unilever) in 1885. They manufactured Sunlight soap, Lux and Lifebuoy in pre-wrapped bars; prior to this, soap had to be cut to order from a single large block, which was an expensive purchase. Three years after rival soap manufacturer Andrew Pears bought John Everett Millais’ Bubbles (1885-86) to promote his products, Lever bought William Powell Frith’s The New Frock (1889, Lady Lever Art Gallery) to promote Sunlight soap. 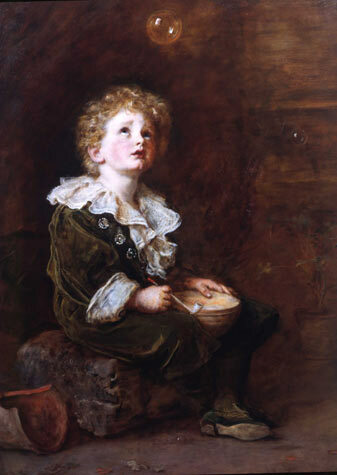 Millais and Frith both objected to the commercial use, but Millais had sold the rights to his painting to the original buyer, and Frith had no copyright agreement. In 1893, Lever bought Thornton Manor in Merseyside, England, and he began collecting art. He served as Member of Parliament (MP) for Wirral, Merseyside, from 1906 and 1909, and he was created a baronet in 1911. In 1917, he was raised to the peerage as Baron Leverhulme, and he served as Mayor of Bolton, his birthplace, from 1918 to 1919. He became Viscount Leverhulme in 1922, and that year founded the Lady Lever Art Gallery, dedicated to his late wife, in his model village, Port Sunlight. By 1925, Lever Brothers, the first modern multinational company, employed 85,000 workers around the world. When Viscount Leverhulme died that year, he left £1 million in his Will and an art collection now worth tens of millions of pounds. The 1st Viscount Leverhulme bought the Rossetti painting at auction in 1917 and kept it at Thornton Manor for his personal enjoyment. His son, William Hulme Lever, 2nd Viscount Leverhulme (1888 – 1949), acquired the Holman Hunt after it was auctioned in 1931, and he purchased Tissot’s A Visit to the Yacht from the Leicester Galleries in 1933. The 2nd Viscount was a co-founder of Unilever in 1930; Lever Brothers is now part of Unilever. Tissot’s A Visit to the Yacht, Rossetti’s A Christmas Carol, and Holman Hunt’s Tuscan Girl Plaiting Straw, all currently owned by the Estate of the 3rd Viscount Leverhulme, are being sold by the Trustees of the 3rd Viscount Leverhulme Will Trust. Philip William Bryce Lever, 3rd Viscount Leverhulme (1915 – 2000), succeeded to the title in 1949; he became Lord Lieutenant of Cheshire a few months later and was appointed a Knight of the Garter in 1988. Prior to his death in 2000, he lived and entertained at Thornton Manor in Cheshire, where his guests included Her Majesty the Queen Mother, Prince Philip, Princess Margaret, and Lord Snowdon, as well as members of other royal families, heads of state, and notable people from the worlds of industry, academia and the arts. The last male descendant of the 1st Viscount Leverhulme, his titles became extinct. Following Sotheby’s sale of The Leverhulme Collection from Thornton Manor in June, 2001, several paintings including those by Rossetti, Holman Hunt and Tissot were exhibited at the Lady Lever Art Gallery by the 3rd Viscount’s Executors. Now for sale, the three paintings were exhibited in Tokyo at the end of September, in Hong Kong from October 3 to 7; in Moscow from October 23 to 25; and in New York from November 1 to 6. They will be on display in London from November 14 to 19, 24 to 26, and November 30 to December 4. The record price for an oil painting by William Holman Hunt was set by The Shadow of Death (1873, oil on panel), which was sold at Sotheby’s, London in 1994 for $ 2,778,650/£ 1,700,000. The record for an oil by Dante Gabriel Rossetti was The Salutation of Beatrice (1869, oil on canvas), sold at Christie’s, London in 2012 for $ 3,334,788/£ 2,169,250 (Premium). The record price for an oil by James Tissot was Le banc de jardin (The Garden Bench, c. 1880, oil on canvas), sold at Sotheby’s, New York, in 1994 for $ 4,800,000/£ 3,035,093. The most recent sale of a Tissot oil was In the Conservatory (Rivals), c. 1875. Deaccessioned by the Metropolitan of Art, it was sold at Christie’s fall sale of 19th Century European Art in New York on October 28, 2013, for $2,045,000/£ 1,270,817 (Premium). See For sale: In the Conservatory (Rivals), c. 1875, by James Tissot. 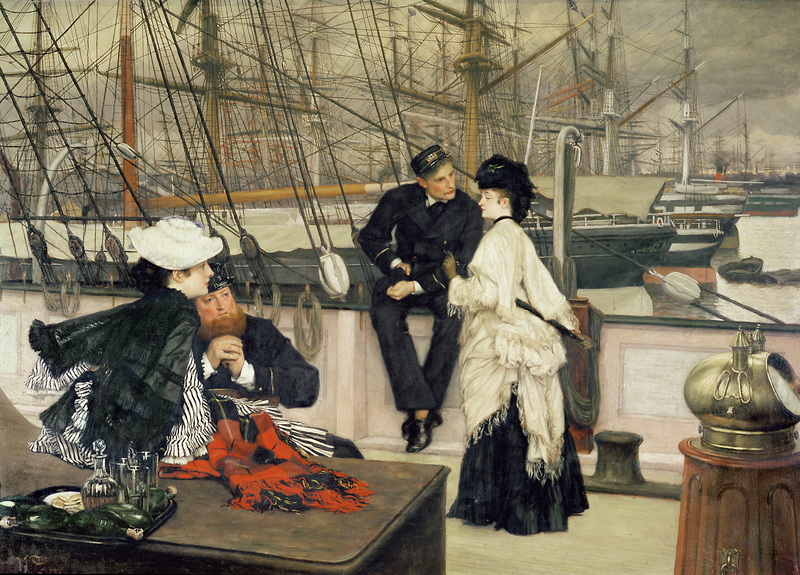 Tissot’s A Visit to the Yacht* is related to his The Last Evening (exhibited at the Royal Academy in 1873), Boarding the Yacht, and The Captain and the Mate, all painted in 1873. * Note: A Visit to the Yacht did not find a buyer at Sotheby’s, London on December 4, 2013. However, it was announced later that the painting was sold privately to a buyer in the United States for a price within the estimated £2 to 3 million GBP it was expected to bring at the auction. © 2013 by Lucy Paquette. All rights reserved. This entry was posted in Art blog, Art History, Impressionists and tagged 1st Viscount Leverhulme, 2nd Viscount Leverhulme, 3rd Viscount Leverhulme, James Tissot on November 10, 2013 by Lucy Paquette, author of The Hammock: A novel based on the true story of French painter James Tissot.